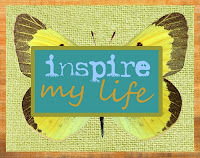 "Inspire My Life" Art Retreat - July 2011! 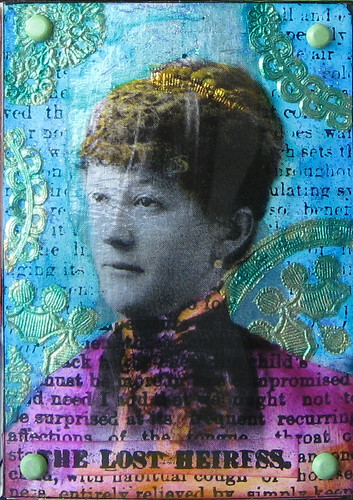 Looking for some mixed media fun this summer? Kim Geiser is organizing Inspire My Life, an art retreat in Manitowoc, Wisconsin from July 28-30, 2011. She hopes to have the full schedule up by early April, but instructors include Kim Rae Nugent, author of Interactive Art Workshop , and my fellow Milwaukee ATC buddies, Mel Kolstad and Kathi Pecor, among others. 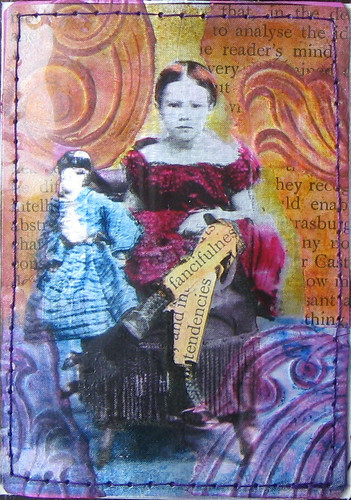 I'll be teaching "Colorful Faux Tintype Artist Trading Cards" on Saturday, July 30, 2011. Hope you can make it! 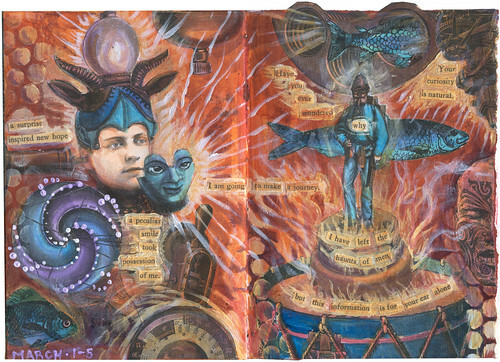 This past week, I've been working on a journal spread inspired by Michael deMeng but since the March Sketchbook Challenge theme is Spilling Over, I perhaps used some of his techniques to excess! I was fortunate to take two workshops from Michael at the Raevn's Nest Art Retreat in 2008, and I learned a lot from his techniques creating the effect of age and patina using acrylic paints. All these images started out as black & white photocopies of Dover vintage clip art (and one 19th century portrait from my personal collection) and were colored with paint. My friend Gary used Michael's "ghostly glow" technique on his ATCs last month, so I had a go at that with mixed results. 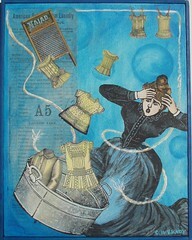 The interpretation of this collage is up to you! 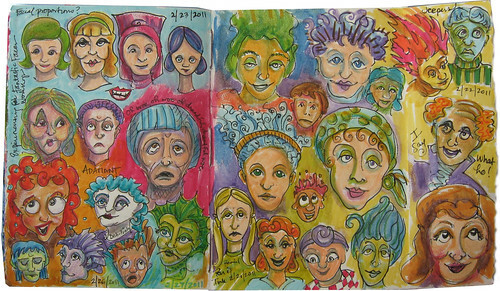 I'm taking the Fantastic Faces on-line workshop at ArtTrader Magazine taught by Annie Melione, aka Eraser Queen. 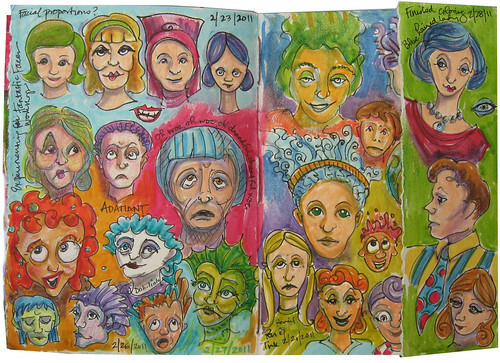 So this past week, I worked on a journal spread where I sketched a few faces each day and then inked and colored. 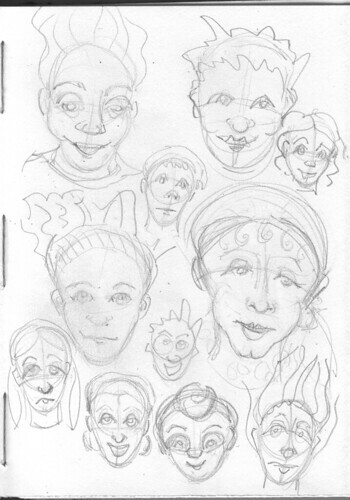 Here are some starting pencil sketches, fiddling with proportions and seeing where each face might end up. Here is the finished spread the folding flap on the right side closed and opened. You can click on the images to see a larger version on Flickr.